So I’ve really been wanting to take some classes of late. Craving them actually. I took a 2 hour blogging class last October, learned some great tips and met new friends. Win:Win! My little blog has brought me nothing but joy .. and provided me with a creative outlet and community I never knew I belonged to. Until I experienced it. But, because of budget cuts, many “adult education” classes formerly offered have been cut back. Way back. As in … gone. What’s left are a hodge-podge of computing skills, crafting and fitness how-tos. I know what I need to on the first, can skip the second and the latter, while of interest, mostly take place while I’m at work. Doing a little sleuthing, I remembered that a former colleague started a Life Coaching business some time ago and that she offers a “Vision Board” class. A class I’d really like to take. On the other side of the state. With no dates that work for me in the foreseeable future. Then, one day, it just came to me: Organize it. In a matter of hours, I narrowed down a location, picked a few dates that would work for me and contacted Coach Beth. Yes, she’d drive over to my area to do the class, in fact she thought it sounded like fun! I didn’t start a new business. I didn’t spend a bunch of money. I haven’t done anything drastic. I stepped out of my comfort zone and reached out to others I don’t know well but want to. I dusted off old skills from my bag-o-tricks – networking, organizing, event planning, and coordinating. I’ve organized, strategized and am having a blast promoting it. Sure there remain a few details to be worked out but – phssh – compared to all the stuff I used to do for everyone else (and stopped doing) … this is easy-breezy-Covergirl material! And … yes the workshop is for others but, for once, it’s just as much for me. Risk. It doesn’t have to be a four letter word. What have you been thinking about doing? Learning something new with friends – Sweet! Good for you. Sounds like great fun with your friends Terri and Beth. I see some organizing posts in the future. Thanks for sharing your vision board. 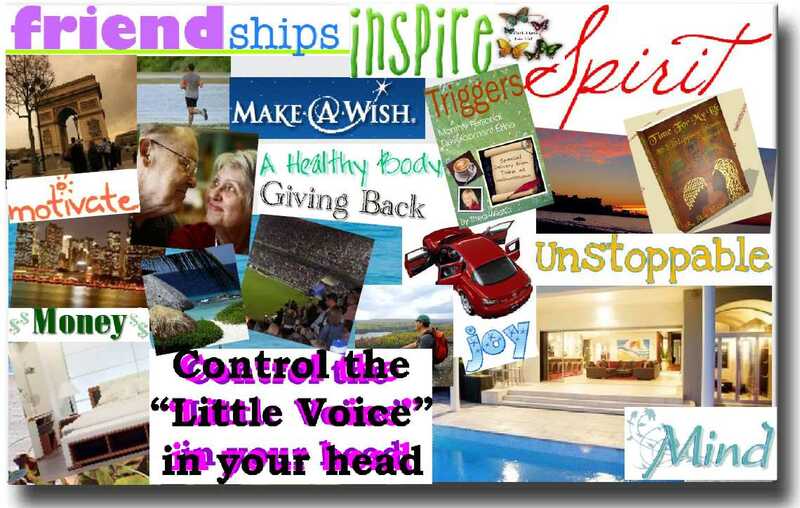 I attended a blogging conference recently where we created our own vision boards. I tend to dread these activities, but I decided to go with it and loved my result. I hang it over my home office desk to remind me what I’m doing and why I do it. It’s inspiring and does keep me on track. Actually .. the class is coming up in October and the photo I shared is a sample from the Teacher’s webpage. I’m looking forward to it. I’ve never created a vision board before but I am a list maker and have definitely seen my goals manifest by referring back to (and being aware) of what was on that list. Good for you! What’s the quote about being the change you want to see? I guess if you can’t go to the class, bring the class to you! Hope it goes well. This is great! So often, I’ve had an idea, but haven’t acted on it….mostly because of fear of taking the chance. I’ll remember your “risk: 4 letter word” motto! decided on what you desire.” – Anthony Robbins. As I get older I get more risky. Maybe its the “what’s the worst that can happen” attitude that scared me silly when I was young. You did it. I mean, you visualized it and you made it happen. Excellent! You continue to be an inspiration, MJ. Thank you.